Two ships previously regarded as classics reappeared last Friday in new guises when Swan Hellenic’s 12,499-ton Minerva sailed from Portsmouth and Costa Cruises’ now 56,000-ton Costa Romantica was renamed Costa neoRomantica at Savona. Both ships have had new structures added above their bridges and extra balcony cabins added alongside. The Minerva’s new look was the result of a multi-million pound refurbishment at Lloyd Werft in Bremerhaven. She now features a new forward facing observation lounge and bar on the top deck, a new outdoor walk around promenade deck, thirty-two new balconies added to existing cabins and new en-suite facilities in every cabin. The work started on December 7. 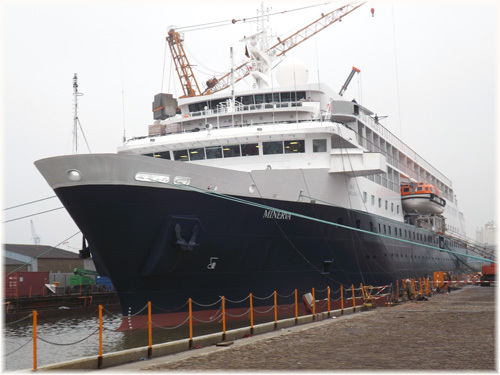 This first major refit for the Minerva since she was completed by T Mariotti at Genoa in 1996 has been paid for by the ship’s owners, Arctica Adventure & Cruise Shipping Ltd. She will begin her 2012 season with an offering of spring cruises around the Canary Islands, Mediterranean and Black Sea. Meanwhile, on the same day as Minerva re-entered service in Portsmouth, Costa Cruises rechristened its newly refurbished Costa neoRomantica in Savona, keeping the ceremony private out of respect for the victims of the Costa Concordia. Serving as godmothers were Costa Club repeat customer Francesca Scuffi and Gabriella Gentile, the most junior crew member of the Costa Concordia, chosen to express the owners’ appreciation for their role in the rescue of survivors. During the dry-docking, two new half-decks were added atop the ship forward, and 111 new cabins, and 120 balcony cabins and suites created. The ship features new contemporary interiors by Sweden’s Tillberg Design and by London-based Syntax, specialists in hotels and spas. Capacity has risen from 1,697 to 1,800 passengers on the same hull, with the number of cabins upped to 789, while gross tonnage has grown from 53,049 to about 56,000. 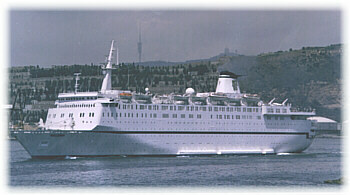 The 1993-built Costa Romantica was rebuilt by the T Mariotti yard in Genoa, where work started on November 2, at a cost of €90 million. 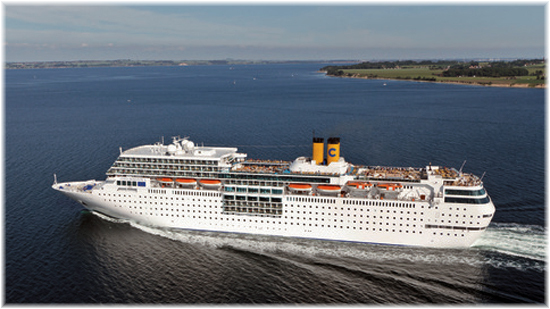 As Costa neoRomantica, she is now debuting in her new shape on a cruise to the Mediterranean and Canary Islands. For more than a century the Union-Castle Line and its predecessors maintained the vital link between the UK and South Africa, until that service was withdrawn in 1977. After this, the St Helena Line operated a basic cargo-passenger service that also served the island of St Helena. Even that link ended however in 2011 when the 128-berth St Helena, second of the name, sailed from the UK for the last time, leaving Portland, Dorset on October 14. 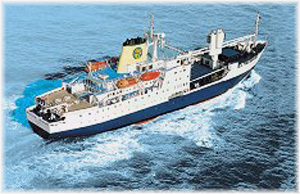 The St Helena now serves the island of St Helena only from Cape Town. Now, therefore, those wanting to sail between Europe and Cape Town need to rely on cruise ships making positioning voyages. Chief among these is now MSC Cruises, owners since last year of South Africa’s Starlight Cruises, who operate two ships from South Africa in the southern summer. 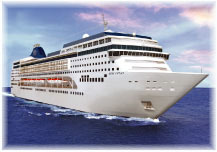 The first sailing for 2012 left Cape Town almost two weeks ago, when the MSC Melody departed for Genoa. Fleet mate MSC Sinfonia will offer a second departure from Cape Town on March 30, on an 18-night voyage to Genoa, with calls en route at Walvis Bay, Dakar, Tenerife, Madeira, Malaga and Civitavecchia. 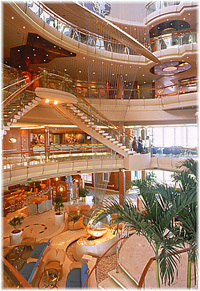 There are also occasional voyages by other ships, most on world cruises. 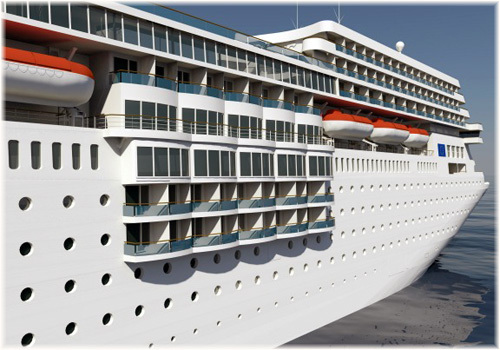 On April 11, for example, P&O’s 82,972-ton Arcadia will depart Cape Town on a 16-night sailing on the old Union-Castle route to Southampton, while on May 7, affiliate Princess Cruises’ 30,277-ton Ocean Princess is due to leave Cape Town on a similar voyage that will finish in Dover. In addition to these sailings, Classic International Cruises is offering two special South Africa liner voyages this spring, an 18-night voyage from Australia and a 22-night voyage from Cape Town to the UK. Their 16,144-ton Athena leaves Fremantle on April 14 for Cape Town, where she is due on May 1, and she will then depart Cape Town on May 2, on the next leg to Portsmouth, where she is due to arrive on May 24. Classic’s new voyages are available as the line has decided to use the Cape of Good Hope route rather than Suez for her return to Europe. Next winter, MSC Cruises will send MSC Opera to South Africa for the first time to join MSC Sinfonia, meaning two southbound voyages to Cape Town by newer ships. MSC Opera will sail from Venice on November 1, calling at Malta, Mallorca, Casablanca, Agadir, Dakar and Walvis Bay, while MSC Sinfonia sails from Genoa on November 9 via Toulon, Valencia, Lisbon, Madeira, Cape Verde and Walvis Bay. Both sailings will take 19 nights. MSC Opera will then make an early northbound departure on March 5, 2013, leaving Cape Town for Genoa, while MSC Sinfonia will leave Cape Town several weeks later, on April 16, for both Civitavecchia and Genoa. Other sailings are available from time to time as well with Cunard Line’s 148,528-ton Queen Mary 2, the largest ship ever to serve the route, and Saga’s 24,492-ton Saga Ruby, for example. And in 2014, one of the more luxurious ships to serve the route will be Crystal Cruises’ 68.870-ton Crystal Serenity, set to depart Cape Town on March 28, 2014, on a 21-day voyage to Southampton. Royal Caribbean International’s 1997-built Rhapsody of the Seas entered Sembawang Shipyard in Singapore last Friday to begin a month-long, $54 million drydocking where she will undergo a mid-life refit and emerge with an array of new amenities. The project is the largest of its kind to take place in Singapore and will employ more than 800 locals. Part of the cruise line’s Vision Class, Rhapsody of the Seas will receive a host of new dining and entertainment venues as well as a number of technological upgrades. She will also undergo a bow-to-stern replacement of all furniture, carpet and upholstery, including renovation of staterooms. The refit is part of the line’s Royal Advantage revitalization program, to bring older ships up to the same standard as more recently nuilt vessels. As with sister ship Splendour of the Seas, which underwent her refit last November, Rhapsody’s new dining venues will include a Chops Grille, Izumi Asian restaurant, Chef’s Table and Park Cafe. She will also receive a new Diamond Lounge for repeat guests, a Concierge Lounge for suite guests and top tier loyalty guests and a transformed Viking Crown Lounge. New passenger offerings will include ship-wide Wi-Fi, a digital way finding system, an outdoor movie screen, as well as iPad’s in every stateroom carrying content on the ship’s amenities and activities. The ship’s Centrum will be transformed into a chic new sophisticated venue featuring daytime activities, nightly entertainment and aerial spectacles, with the Centrum Champagne Bar becoming the R Bar, with its own 1960s theme, iconic furnishing and signature cocktails. When the refit is complete on March 28, Rhapsody of the Seas will undertake a 15-night voyage from Singapore to Sydney. From there, she will cross the Pacific with combination cruises from Australia and Hawaii before beginning her Alaska season in Vancouver in May. The ship will then alternate back and forth between Alaska by summer and Australia by winter. Cruising to Alaska, Rhapsody will offer a series of 7-night cruises this summer, including an open-jaw itinerary from Vancouver to Seattle on May 11, seventeen high season round voyages from Seattle and an open-jaw sailing from Seattle to Vancover on September 7. The early and late Vancouver turarounds allow her to reposition to and from Hawaii on her way to Australia without breaching US cabotage regulations. Rhapsody’s is the second of a series of four mid-life refits, the first of which has already been completed on Splendour. The Grandeur of the Seas will get the same treatment in May and Serenade of the Seas in November.